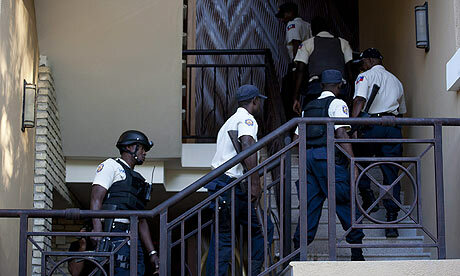 The return to Haiti – and now, possible arrest – of the infamous former dictator, Jean-Claude “Baby Doc” Duvalier, after 25 years in exile in the south of France, has made the headlines this week. But behind the scenes, the US state department and the French foreign ministry have been ratcheting up the pressure on the impoverished, earthquake-wrecked and cholera-stricken country of Haiti. The pressure is not to prosecute the dictator for his atrocities, as human rights groups such as Amnesty International and Human Rights Watch have recommended. The pressure is to force the government of Haiti to accept the decision of the United States and France as to who should be allowed to compete in the second round of Haiti’s presidential election. It is worth looking at the details of this international subversion of the democratic process in Haiti – just to see just how outrageous it is. The first thing to notice is how unusual it is for any electoral authority to change the results of an election without a recount of the vote. Imagine that happening in Florida in 2000, or Mexico in 2006, or in any close, disputed election with irregularities. It just wouldn’t happen. There could be a recount and a new result; the original result could stand; or the election could be redone. But the electoral authorities don’t just change the result without a recount. Now, add into the mix that the electoral body seeking to change the result of the election is the Organisation of American States (OAS). More accurately, it is Washington, which controls the bureaucracy of the OAS in these situations (unless there is a lot of pushback from South America, as happened after the Honduran coup in 2009). In fact, six of the seven members of the OAS “expert verification mission” are from the United States, Canada and France. France! Not a member of the OAS but the former slave-holding colonial power that was still forcing Haiti to pay for its loss of property (that is, the slaves who liberated themselves) until the 1940s. Apparently, the OAS couldn’t find any experts in all of Latin America (though they found one from Jamaica) to review Haiti’s election. This is not a matter of political correctness; rather, it indicates how much Washington wanted to control the result of this OAS mission. These are the three governments that led the effort to topple Haiti’s democratically elected president, Jean-Bertrand Aristide, in 2004. WikiLeaks cables released this week show that the United States also pressured Brazil to help keep Aristide out of Haiti after the coup. Since Aristide was, and remains to this day, the most popular politician in the country, the WikiLeaks cables show that Washington and its allies also worked to keep him from having any influence on the country from his forced exile in South Africa. As it turns out, the OAS “experts” did a very poor job on their election analysis. They threw out 234 tally sheets, thus changing the election result. According to the OAS, the government candidate, Jude Celestin, was pushed into third place and, therefore, out of the runoff election. This leaves two rightwing candidates – former first lady Mirlande Manigat, and popular musician Michel Martelly – to compete in the runoff. The OAS has Martelly taking second place by just 3,200 votes, or 0.3% of the vote. The first problem with the OAS mission’s report is that there were more than 1,300 ballot sheets, representing about 156,000 votes, that went missing or were quarantined. This is about six times as many ballot sheets as the ones that the mission eliminated. Since these areas were more pro-Celestin than the rest of the country, he would very likely have come in second if the missing tally sheets had been included. The mission did not address this problem in its report. The second problem is that the mission examined only 919 of the 11,181 tally sheets to find the 234 that they threw out. This would not be so strange if they had used statistical inference, as is commonly done in polling, to say something about the other 92% of ballot sheets, which they did not examine. However, this is not included in the leaked report. So far, Haiti’s Provisional Electoral Council (CEP) hasn’t caved. But the pressure and threats are very intense. Some of it appears to come from hard-right Republicans, whose influence on foreign policy in the western hemisphere has remained strong under the Obama administration and has increased with their takeover of the House of Representatives. Rightwing activists such as Roger Noriega, who was involved in the 2004 Haitian coup as President Bush’s assistant secretary of state for western hemisphere affairs, are among those fighting to control the runoff election in Haiti. Of course, the obvious solution would be to re-run the election, since nearly three-quarters of registered voters didn’t vote in the first round, reflecting the fact that the country’s largest political party – not coincidentally, the party of Aristide – was arbitrarily excluded. But Washington and its allies don’t want to take any chances that they could end up with a free and fair election in Haiti, which hasn’t led to their preferred outcome in the very few times that it has been allowed.